Tyreke Evans #13 of the Rookie team shoots against the Sophomore team during the second half of the T-Mobile Rookie Challenge & Youth Jam part of 2010 NBA All-Star Weekend. 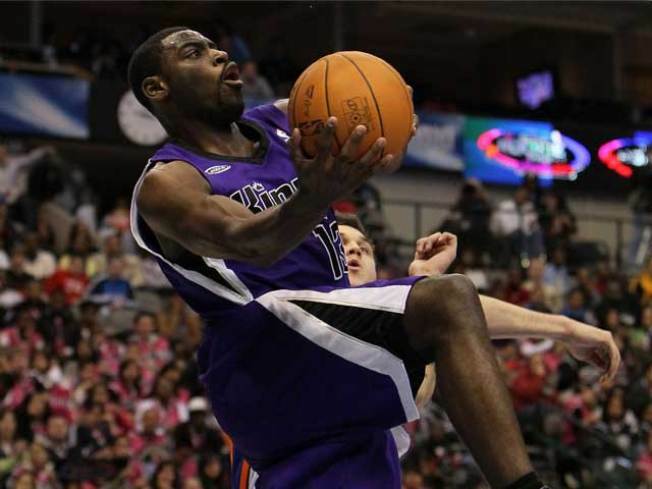 Sacramento's Tyreke Evans had 26 points, and San Antonio's DeJuan Blair had 22 points and 23 rebounds to give the NBA rookies a rare victory over the sophomores, 140-128 in the Rookie Challenge on Friday night. Evans, the league's top-scoring rookie and 14th overall with 20.3 points a game, made 11 of 15 shots to go with six rebounds and five assists. Milwaukee rookie Brandon Jennings had 22 points and eight assists, and James Harden from Oklahoma City also had 22 points. Blair, who told his teammates before the game that he was going for every rebound, had one of the highlight plays after a turnover by the sophomores in the first half. Stephen Curry flipped the ball to Blair, who threw it off the backboard and grabbed it out of the air before slamming it home. In the closing seconds of the game, Blair chased down a ball in the corner and scooped it underhand to save it from going out of bounds. After getting back on the court and begging for teammates to get him the ball, he scored despite being tackled by New Jersey's Brook Lopez under the basket. Both players were smiling in a pile on the floor after the ball fell through the hoop at the American Airlines Center, the Dallas Mavericks' home arena. Only Sunday night's All-Star game will be played at Cowboys Stadium. The sophomores then scored six straight points. Eric Gordon had a basket, then a dunk off on an assist from Mayo. Anthony Morrow drove the baseline for a reverse layup, but the newbies got all those points right back. Jennings hit long jumper, Jonny Flynn drove for a layup and Jennings then had a breakaway layup to make it 61-51.